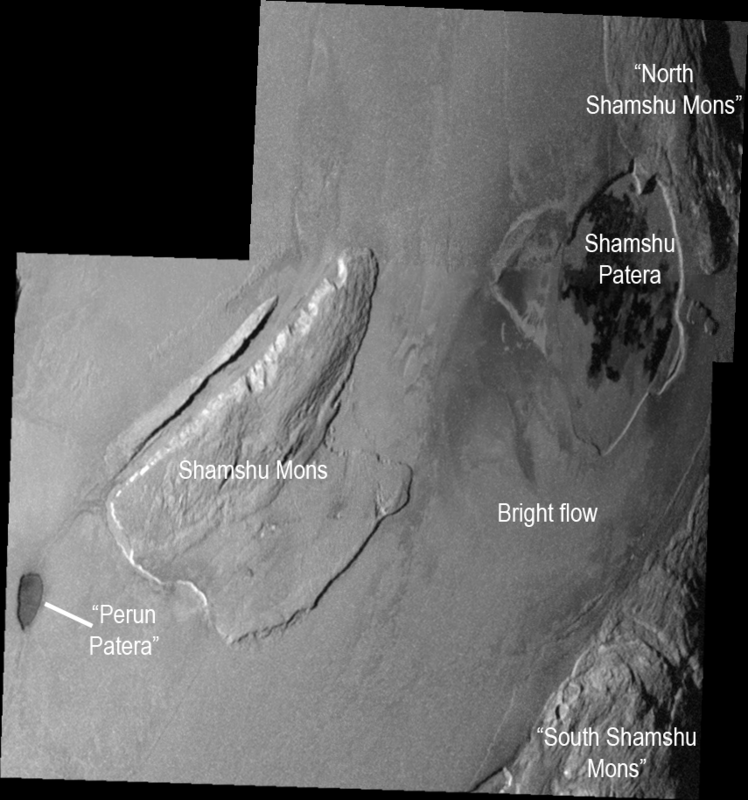 On Friday, a new paper was published in press in the journal Icarus titled, "Geologic mapping of the Hi’iaka and Shamshu regions of Io". In press articles are those that have been reviewed and approved for publication, but have not yet been published in the print journal. This paper, by Melissa Bunte, David Williams, Ronald Greeley, and Windy Jaeger. This paper discusses the results of a geologic mapping project based on the 25ISTERM__01 mosaic of the Hi'iaka region and the 27ISSHMSHU01 mosaic of Shamshu region [I've also uploaded labeled versions of these two mosaics, Hi'iaka and Shamshu, to help people with this discussion]. 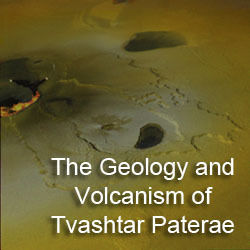 These two regions are dominated by a patera with a floor partially covered in dark lava flows surrounded by several large mountains. This paper is part of a series of geomorphologic mapping projects using medium-resolution Galileo mosaics of Io for their basis. We previously covered papers discussing maps of Prometheus and Zal. Other regions mapped by the ASU group include: Chaac-Camaxtli, Culann-Tohil, Zamama-Thor, and Amirani-Skythia-Gish Bar. In March, I covered this group's LPSC abstract covering the mapping of Hi'iaka and Shamshu, so bare with me if I repeat some things from that post..
For this paper, the authors created two geomorphologic maps of the regions surrounding Hi'iaka and Shamshu Paterae, two volcanoes near Io's equator on the leading hemisphere. 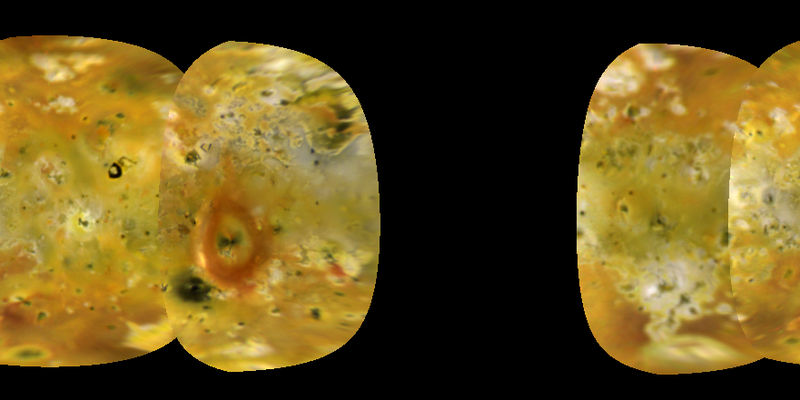 These maps were based primarily on two SSI mosaics from Galileo's I25 and I27 encounters with Io in November 1999 and February 2000, respectively. Color information and low phase brightness information was taken from the global color mosaic produced by the USGS. Geomorphologic maps are a type of geologic maps where different surface units are identified and mapped so that relationships between these different units can be identified. In the case of the Hi'iaka and Shamshu regions, four basic units types were identified: plains material, mountain/plateau materials, patera floor materials, and lava flow materials. These units were also identified in the mapping of other regions on Io, though diffuse material, recent surface coatings that are derived from volcanic or sapping processing and identified in other mapped regions, was not identified in the Hi'iaka and Shamshu regions. It should be noted though that diffuse materials are often transient; red diffuse material was observed in a faint partial ring of material surrounding Hi'iaka during Galileo's first orbit of Jupiter, suggesting the presence of a plume at Hi'iaka shortly before June 1996. These four basic units were further sub-divided into different sub-units based on their albedo, color, surface texture, or structural contacts. For example, mountain units are divided into lineated (ridged/grooved material, generally found at higher altitudes, bounded with plains by scarps), mottled (hummocky, often with lobed margins), undivided (intermediate in texture and altitude between the mottled and lineated types), and plateau (flat-lying terrain with smooth or hummocky textures) types. 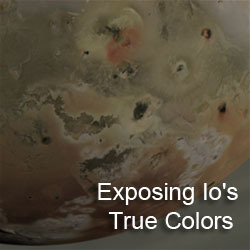 Based on the spatial relationships between these units, the authors theorize that these types represent different stages of degradation on Io's mountains. Lineated mountain units tend to be higher standing and have sharper unit contacts with the surrounding plains, suggesting that terrains of this unit have undergone the least amount of degradation. The ridges and grooves, such as those seen above at north Hi'iaka Montes, are the result of down slope slumping of a mobile surface layer atop the mountain (see Jeff Moore's 2001 paper on slope degradation on Io). Remember that mountains are thought to be tilted crustal blocks, the ridged and grooved top surface of the mountain is the result of the upper few kilometers of the mountains, which is a mix of basalt and sulfurous materials that was once part of the upper few kilometers of Io's flat plains. Once that upper layer sloughs off, the unit transitions to the undivided or mottled types (though the mottled types are likely a mix of old mountain and the mass wasted materials surrounding the mountain). A similar age progression in sub-units was also noted in patera floor and lava flow materials based on color and albedo (for dark flow/patera floor materials, darker equals younger). The paper only mentions briefly the debate whether some bright or yellowish lava flows are primary or secondary sulfur flows, or silicate flows with chemical altered surfaces. The authors (and I agree) that these flows are likely old silicate flows. This supported less in this region but at Thor, where an outburst eruption generated lava flows that overlapped those of an older, yellowish flow. Exceptions to this could include a bright white flow to the south of Shamshu Patera and the orange floors of "Mekala Patera" and western Hi'iaka Patera, which could be due to mobilized sulfur dioxide and sulfur, respectively. 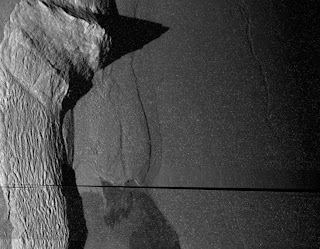 As I mentioned in my post from March on the researchers' LPSC abstract on this subject, the authors examined the hypothesis that the three mountains that surround Hi'iaka Patera had at one point been part of a single structure that had split apart as a result of strike-slip and extensional faulting. This fault would have also resulted in the creation of pull-apart basins that would become Hi'iaka Patera and orange-color patera to the lower left of north Hi'iaka Montes (named Mekala Patera in the paper). The authors note that the freshest lava flows on the floor of Hi'iaka appear to emanate from the eastern and southern margins of the patera, a pattern consistent with this break-up scenario. This model of regional-scale plate tectonics was also applied to the mountains in the Shamshu region (with Shamshu Patera being presented as a pull-apart basin) with less convincing results, but it does suggest a new line of investigation to see just how prevalent this style of plate tectonics is on Io with mountains forming, breaking apart, and shifting around across Io's surface. How many other close groupings of mountains were the result of a single mountain being broken apart by strike-slip and extensional faulting? 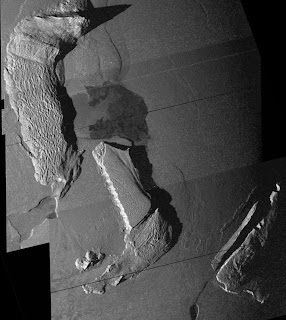 I should note that several Ionain mountains have been observed with canyons running down the centers as a result of extensional faulting, like Ionian Mons (upper left), Mongibello Mons, and Danube Planum. This paper summarizes the results of geomorphologic mapping of the Hi'iaka and Shamshu regions on Io based on regional-scale imaging by Galileo, finding units consistent with those found in other regional mosaics of the satellite. The geologic history of these regions based on their mapping supports earlier research into this area by authors like Turtle et al. 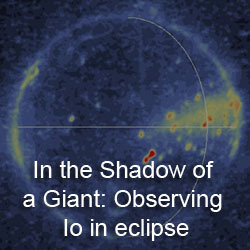 2001 and Jaeger et al. 2001 that Hi'iaka Patera formed as the result of Hi'iaka Montes breaking apart by strike-slip and extensional faulting. Magma then ascending to the surface using these same faults that bounded the pull-apart basin. At this point, the volcanic activity at both Hi'iaka and Shamshu appear to be dominated by compound lava flows, unlike the lava lakes seen at Pele and Loki. The mountains were then further degraded by gravitational mass wasting, SO2 sapping from ice layers within the mountain, and thermal erosion from nearby volcanoes. 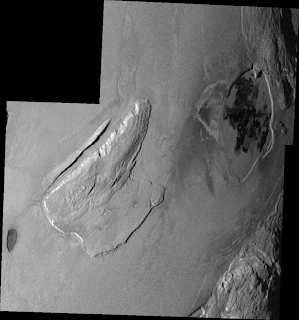 Thermal erosion by flowing lava is thought to be responsible for Tawhaki Vallis, a channel observed to the right side of the image at top, as proposed by Schenk and Williams 2004. Each of mountains in the region exhibit signs of degradation, from the ridges and grooves atop north Hi'iaka Montes and north Shamshu Montes, indicative of a slumping mobile surface layer, to hummocky-textured and lobe-edged landslide deposits, indicative of gravitationally- or sapping-induced mass wasting. I think that leaves one more region to map, Tvashtar.